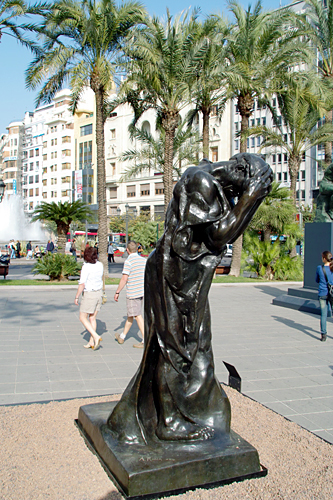 Seven works of one the world’s most renowned sculptors, Auguste Rodin, are currently on display in the Plaza de Ayuntamiento. 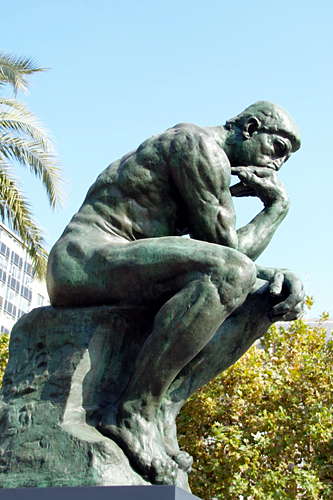 And these aren’t “just any” Rodin art pieces. 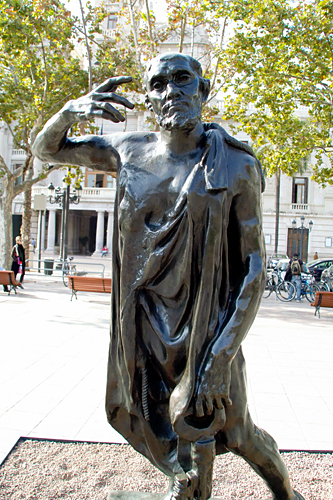 Valencia is playing host to his masterpiece, The Thinker, as well as one of his most powerful and praised sets, The Burghers of Calais. The Burghers of Calais was made in homage to an historic event. During the Hundreds Year War, the city of Calais was besieged and eventually vanquished by the English King Edward III, who vowed to stop the devastation only if 6 noblemen from Calais would deliver the city keys to him personally. A couple sadistic little catches, though: they had to be naked and wear nooses around their necks. 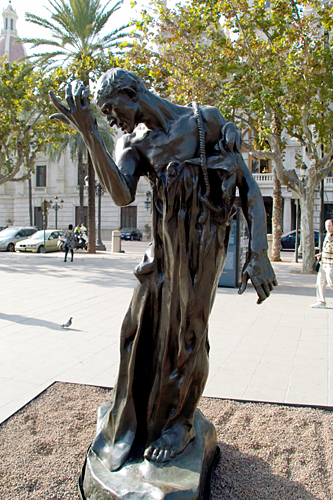 The Frenchmen complied, and Rodin’s larger-than-life sculptures capture the heroism, piteousness and self-sacrifice of these brave, doomed men. 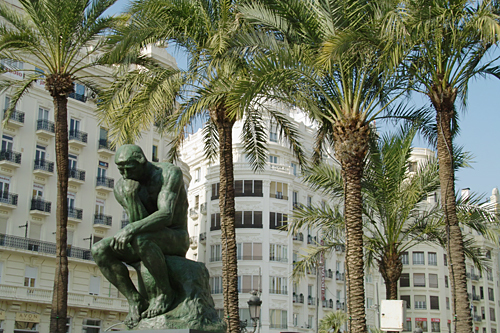 The Thinker needs no real introduction, but it takes on new dimensions in the Plaza de Ayuntamiento. 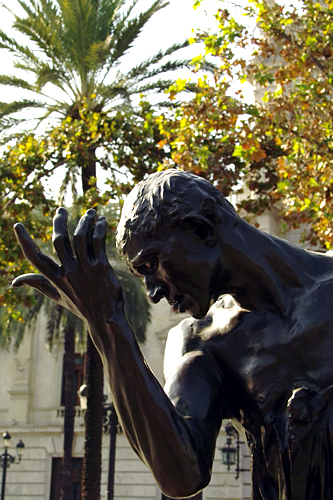 The way the famous Valencian light hits and reflects off the bronze figure is beautiful. We saw it in the middle of the day, and I imagine it looks different throughout the day. And with the large plaza fountain as a backdrop, this will certainly be the most photographed item in Valencia until December 13th, when the exhibit ends. Outstanding ! I really hope you’ll return to the Plaza at night for another photo shoot. With the Plaza lights, shadows, etc……such enrichment of his portrayals ! Will posters be available to purchase? 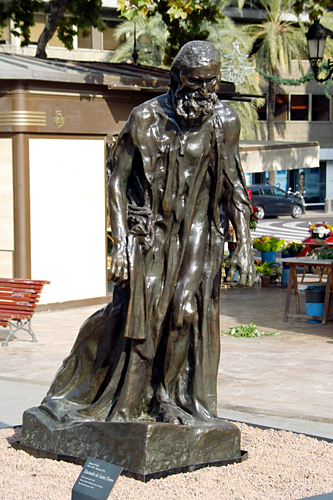 I have seen them two years ago on the main corso of Palma de Mallorca http://riowang.blogspot.com/2008/02/rodin-in-mallorca.html and it is nice to see them again in a different setting.